For the first time in years, South Devon Choir will not be rehearsing on a Thursday night in term time #3wordweather #snow #below-zero #Torquay Winter definitely has a sting in its tail this year. The rehearsal scheduled for Thursday 1st March has been cancelled due to a Met Office amber weather warning for snow and ice on Thursday and Friday. 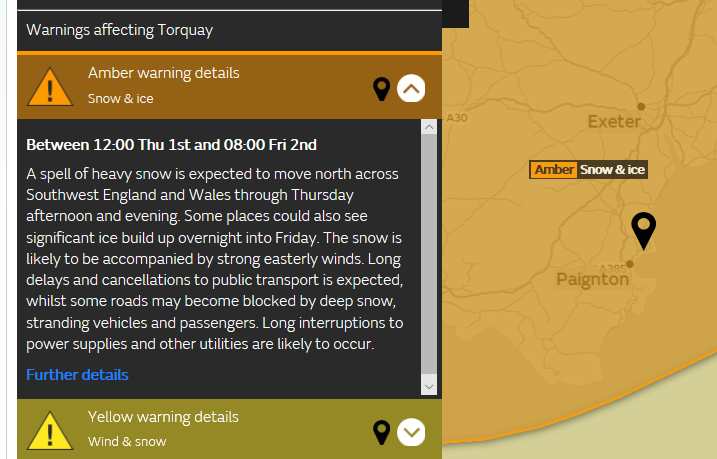 Heavy snow is expected possibly followed by frozen rain, producing hazardous conditions for travelling. In the circumstances, we thought staying tucked up indoors, warm, snug and safe was a pretty good option. The good news is that the weather ahead is looking less cold, spring must surely be on the way and we shall be singing again next week. Practice makes perfect for the wonderful Rossini and Puccini concert programme to be performed on Saturday 21 April. Please do let any choir members you know who are not on the choir email list, or on Facebook, that there is no practice on 1st March.